That’s What You Didn’t Learn in Sunday School. I know the voices you’ve heard all of your life. “How wanton are the women of these heretics! they dare to teach…to dispute, to carry out exorcisms, to undertake cures, it may be even to baptize….It is not permissible for a woman to speak in church, nor may she teach, baptize, offer, or claim for herself any function proper to a man, and least of all the office of priest.” –Tertullian. All of us grew up with these voices whispering insidiously in our ears. For centuries Western Christian theology has promoted the subjugation of women, and it affects many women who grew up even in secular countries. In the last few years I’ve read rants against the evils of feminism from some of the top Evangelical and Fundamentalist Christian leaders who blame women wanting to go to work, go into ministry, and be equals to their husbands for all the social ills happening in our country. If women would just stay home divorce rates would plummet, no abortions would happen, public schools wouldn’t be in trouble, and all the world’s ills would come to an end. Does the Bible really say all of that? There are over 30,000 verses in the Bible. Eight verses have been used to keep women out of leadership positions in both sacred and secular realms. Eight verses have been used to make women second-class citizens, and at times, virtual slaves to their husbands. The rest of the Bible is full of stories of strong women who led their families, their people, and their countries. Deborah who was a prophet, judge, and military leader. Abigail who disobeyed her husband and saved her household. The Syro-Phoenician woman who wouldn’t take “No” from Jesus. Phoebe, a pastor and patron of the early church. It’s time to tell the other side of the story. 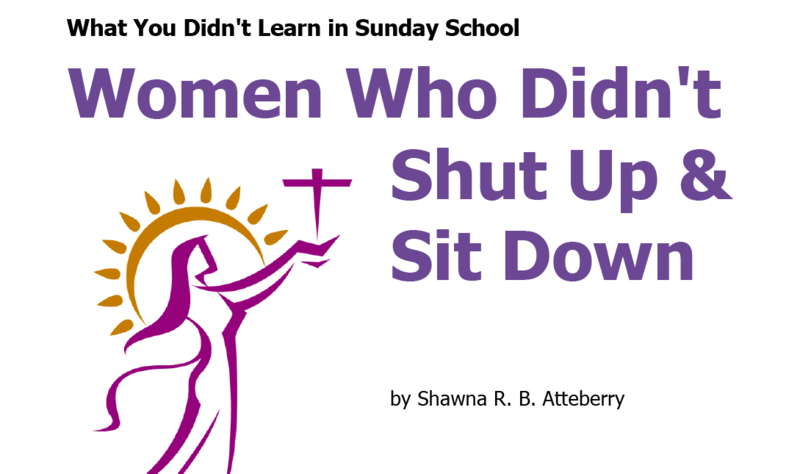 Buy now to learn about the women you never learned about in Sunday School, and to learn about the woman you can become.